The summer break is over for the kids here. July is vacation month, and August traditional brings the start of the new school year. Our first kid’s club was small but full of spirit. We have only one new kid; the rest are the same kids that have been with us sometime. The leadership has changed since Wayne has been in the states. Three teams work together. 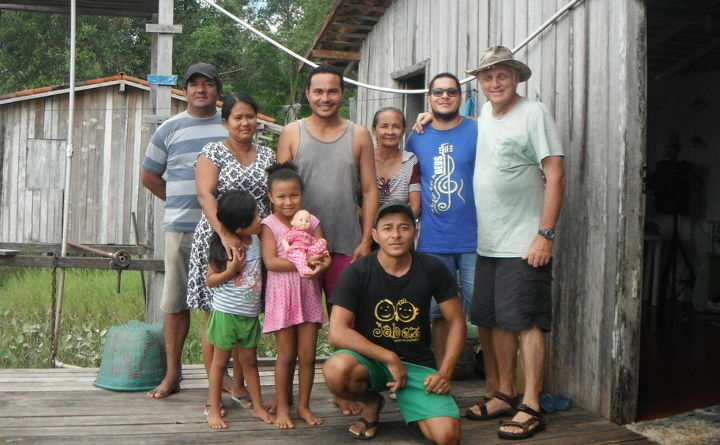 Jeremias and Gena are from the Monkey Island church, and Pastor Luiz is from the city working with a Baptist church. Pray for these teams and the leadership of this ministry outreach. As we settle back into the place, there is some work to be done. My office is down for a few days as we work on the elect systems. Wayne brought some equipment down from the States to help with our poor electricity. One of the problems with the remote location is that our power is not consistent. At night our LED lights will flash like a disco-tech, only not in sync. It is difficult to live in a home where the electricity is up and down all day long. Somedays it is fine while others we turn the lights off and have it dimly lit. My office will be out of commission for a few days while we wire things up. It is inspiring to return to the field this time and have all of the ministries still active as we spent time in the States for our USA ministries. There is a dynamic Bible Study of one type or another Monday through Friday and active kids clubs on the weekends. During our absence, we lost two of our kid’s club leaders, and some of the people in our small groups have drifted or moved off the island, but for the most part, the ministry has held. We are praising God for such a blessing. At the moment most of this ministry is a pause and will start up again in the second week of August. Pray that as we integrate back into these ministries they will grow with God’s blessings.